A 2.5-mile walk around “The Hill of Sacrifice” with 360-degree panoramic views. 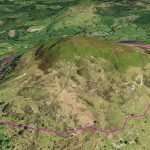 DESCRIPTION: A 2.5-mile circular walk that takes you around the foot of the 1240-feet high Foel Offrwm, (“The Hill of Sacrifice”). While it runs around the ‘base‘, this is still some 800 feet above sea level and offers some exceptional panoramic views. START: The walk starts from the Coed y Groes (Precipice Walk) car park which is 2.3 miles up the main Dolgellau to Llanfachreth road. At the time of writing this, the car park is free and has toilets. 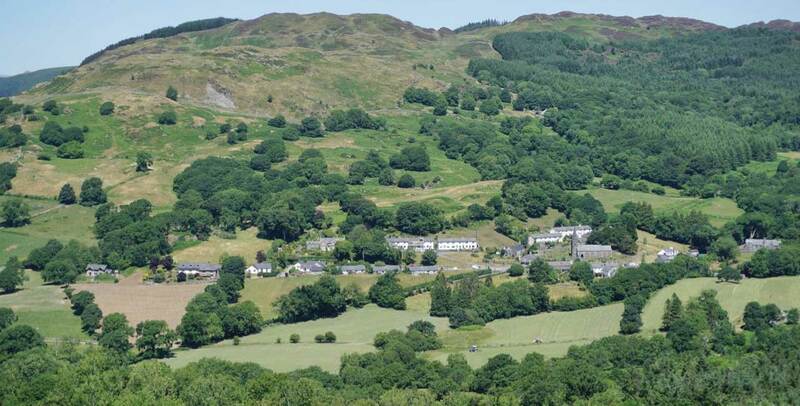 Walk out of the car park and cross the Dolgellau to Llanfachreth road (the one you’ve probably driven up). Just after you cross the road you will see a narrow windy path on your right that leads to a wooden gate, which is is the start of the easy path. The wider main track that veers left is the one you will come back on. 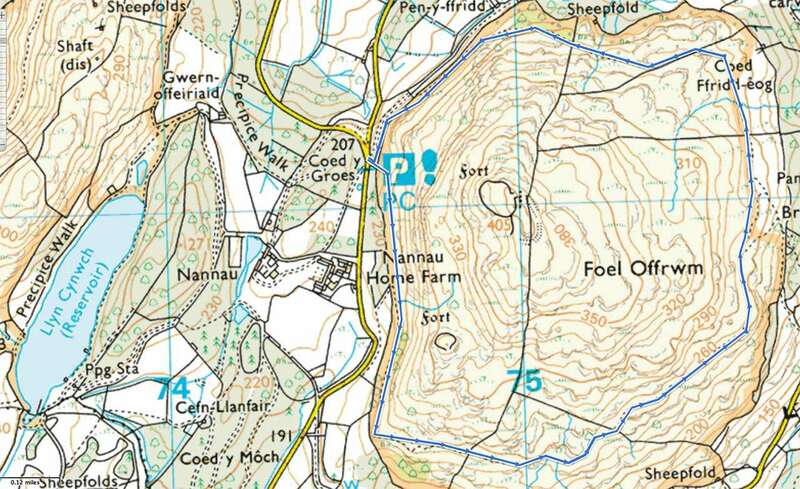 Foel Offrwm, (“The Hill of Sacrifice”) is a lot more pleasant than its name suggests. Whether it was the site for sacrifices is a matter for conjecture, but it was home to Iron Age man a couple of thousand years ago. 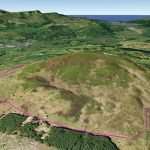 If you walk to its 1240 feet-high summit, you will see the remains of an iron age hill fort, with a second one lower down. However, all that can be left for another day as this is a walk around its feet, or more accurately, its waist, as it runs around 800 feet above sea level. This was one of a few walks planned by the Vaughan family of the historic house of Nannau. 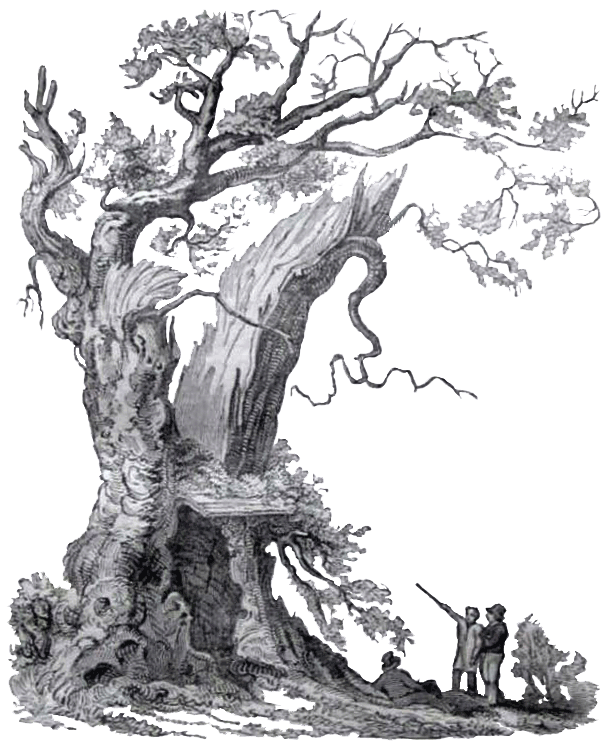 It was created for their personal use, plus, one would imagine, to impress the visitors to their home, the “highest situation of any gentleman’s house in Britain” (according to Thomas Pennant, the eighteenth-century Welsh naturalist, traveller, writer and antiquarian). 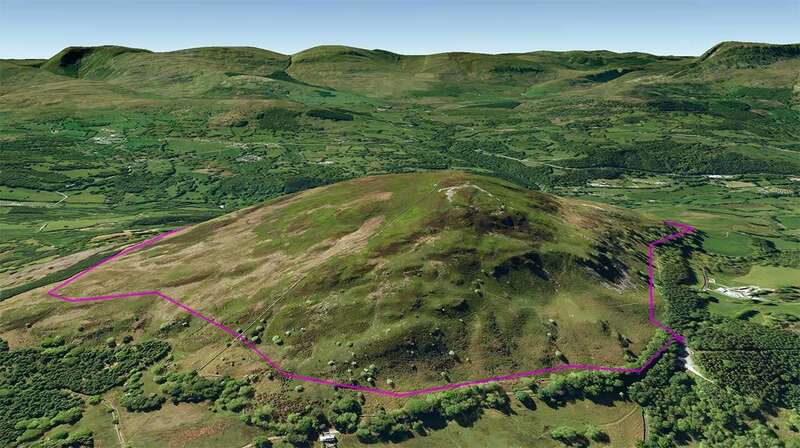 The other more famous walk they designed was Precipice Walk, which starts from the same car park and runs around another hill with an iron age hill fort of its own. While that walk has been popular with tourists, especially the Edwardians, for over a hundred years, this one has been a little overlooked. However, all that is changing as it was given a major overhaul by the current estate owners in 2018 and is now on its way to its former glory. A nice feature of this walk, as with the others created by the Vaughans, is that it’s reasonably flat (another reason why it impressed their guests). 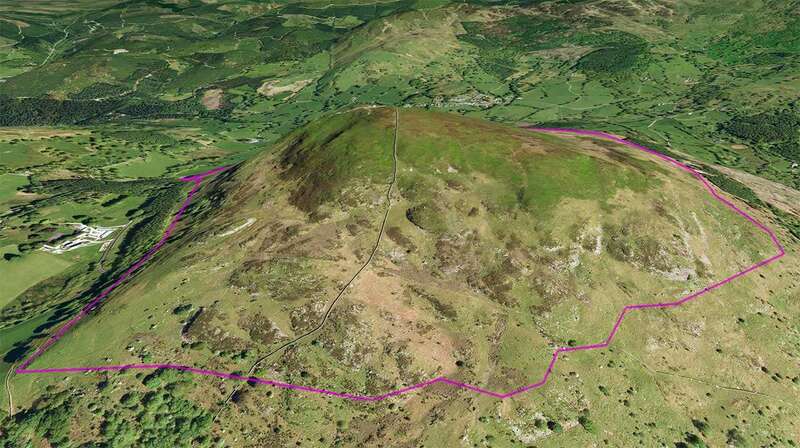 This one has a minimum height of 720 feet and a maximum of 880, although there are quite a few ‘ups and downs’, so the actual ascent/descent is more like 400 feet, most of which is pretty kind to the lungs. It’s also a pleasing length at two and a half miles, so should take anything from an hour to an hour and a half (I’ve even managed it ‘briskly’ in forty-five minutes). While the path started undergoing its ‘facelift’ in 2018, only the first flat section, that runs roughly parallel to the Dolgellau to Llanfachreth Road, was opened then. While walking the rest was still allowed (being ‘open access’ land), the whole route is now a much better prospect with shiny new gates and copious stones covering the more boggier parts that made the walk a little taxing. While this first section is flat, it does become a bit uneven in places, although still just as approachable as its more famous neighbour from across the minor road. Now, pretty much back to its nineteenth-century grandeur, the walk is a real contender for one of the most beautiful walks in the area. The section of around half a mile on a family-friendly path makes a pretty little afternoon stroll for people, dogs and buggies. After this, you get a little more of a rugged walking experience in some open country, and it all concludes with a nice grassy path. 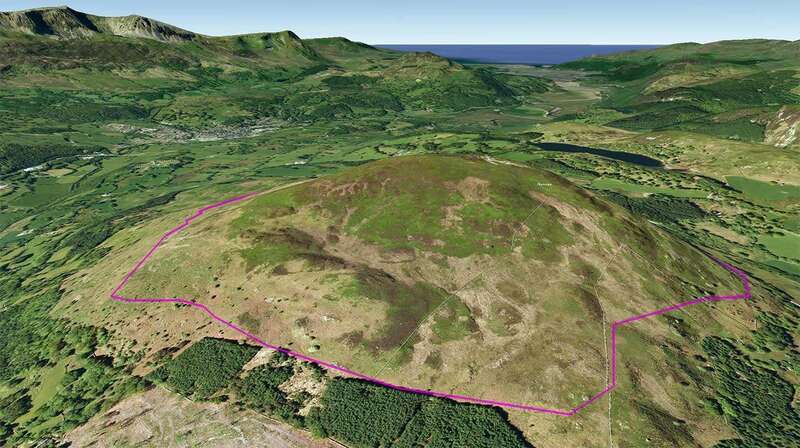 However, the main draw of the walk is the fact that it showcases a full 360-degree vista with panoramic views of the Mawddach Estuary, the Arran, Rhinog and Cader Idris mountain ranges and even the twenty-two miles to Mount Snowdon on a clear day. Another draw is that it’s new and less trodden than others in the area, so its a nice place for a little peace, apart from the bleating of the sheep and the cry of the buzzards. It’s also easier for those who may suffer from a bit of vertigo on the Precipice Walk, as there are no sharp drops here. You can, of course, do the walk anti-clockwise or clockwise, but probably best to start with the former as you get a nice and easy (and well made) path. This section offers views north including views down to the Georgian Mansion ‘Plas Nannau Hall’ which was completed in 1796. This is probably the fifth house of the Nanney & Vaughan families who resided here in continuous one-thousand-year line until the 1960s. This mansion stands on the site of the previous house which was built c.1693. Part of the tower of this house is still visible in the far back corner, as are stones dating back to the reign of Elizabeth I. There is the first of two benches here, perfectly positioned to see the house and its once grand garden and ponds. The walk soon bears left and we are greeted with the first views of the Nannau Deer Park below. If the trees are leaf-less, then you should be able to make out the mini-castle that is ‘Hywel Sele Lodge’ together with its gothic arch. If you want a closer look, the Deer Park Walk can be found elsewhere on this website (and the lodge is also an extremely popular holiday rental if you want to really get up-close). If you look down to your right just before the 90-degree left turn, you can see a low stone wall down below on your right; this is a thousand-feet long deer ‘ha-ha’, built so the family in the house could view the deer without seeing a high wall. The term “ha-ha” is thought to have derived from the vocal surprise of people coming across these ‘invisible’ barriers. You can also make out some of the old fish ponds over the tops of the trees and the ‘pillow mounds’ that look like small graves but were built to house rabbits for the monks of Cymer Abbey. The Deer Park was once home to the Nannau deer, a small (and tasty) variety that was resident until a unusually high snowfall in the 1960s drifted against the nine-feet high boundary walls and created some excellent escape ramps. The herd is still around and thriving in the woodlands of the estate and can be glimpsed from time to time. 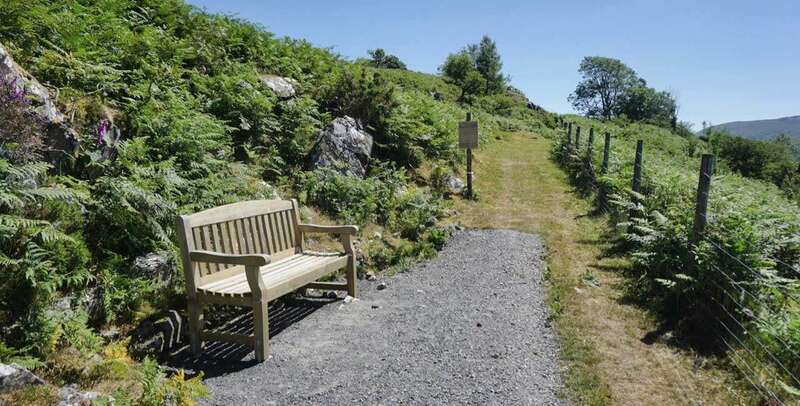 There is a perfectly positioned bench here to see the views over the park towards all the peaks of the Cader Idris mountain range in the distance. Once you leave the bench there is a little flat walk, and then you come to the only main obstacle of the trail which is a high stone wall which you will have to climb over. There may be a stile here soon. Once you have glided gracefully over this minor obstruction, you are in more open countryside with its winding stone and grass trackway, gorse and occasional holly trees. This is where you need to keep your mind on the path ahead in case you get lost. If you are walking too steeply uphill or down, then you are probably a little off-piste! Now the views start to open up again, and you get your first glimpse east towards the Arran Mountains, whilst still having a great view West, including the odd glimpse of the Mawddach Estuary. There are also great views of the rocks of the hill on your left. Soon the path drops down a little, edging to the left of a small conifer plantation. 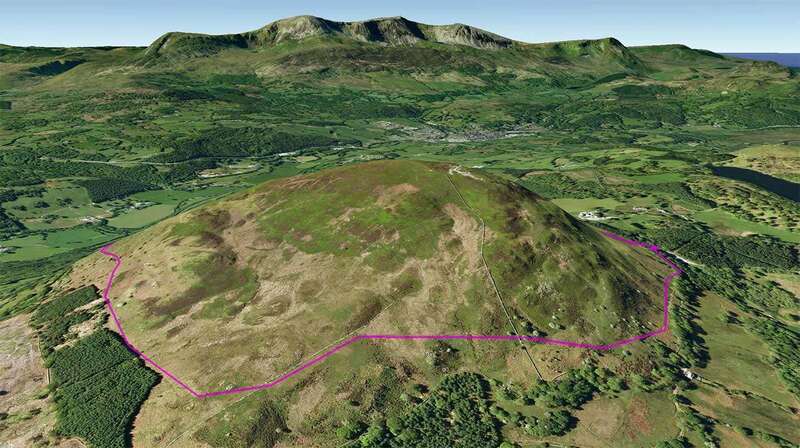 After this, the route winds its way left and we have the first appearance of the northern mountains of Snowdonia with the pretty village of Llanfachreth spread out below. 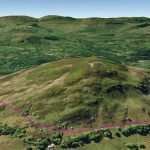 You also have the more gentle and far less craggy side of Foel Offrwm to your left. Shortly you will walk through a gap in the stone wall with some stones buried in the grass. If you cross the wall and follow it up to the top, you will get to the summit and its iron age hill fort. This is the main route up, so if you want to do this, then better to start the walk clockwise. If you’re not up to the whole walk, you can always just do this section, as you get the more grassy path and some excellent views. The hike to the summit from here is a steep and uneven climb of around 530 feet, but easy to follow, just keep the wall close on your left (the wall is also comforting to occasionally grab hold of on the way down). Back to the path which now slowly winds its way down, losing some of the panoramic views, although you get some nice views of the Rhinogs. If you look to the far mountains in the north (and its VERY clear) you can just make out the silhouette of Mount Snowdon, twenty-two miles away. If you look down you will see the white house ‘Pen-y-Fridd’, one of the Nannau Estate’s cottages, built in 1834. Beside the house, there is a gravel trackway which runs to the east. This is yet another woodland walk which ends up at the stone arch of ‘Y Garreg Fawr’ and, a little further on, the village of Llanfachreth. The churchyard contains the Vaughan family vault, the final resting place of some of the nineteenth century Vaughan family, including Sir Robert Williames Vaughan, 2nd Bart. (1768-1843) who was a member of parliament for forty-four years. Drop down to this track and continue, you will soon reach your starting point of the car park (and toilets, should you need them).